It doesn't matter if you are a school, a small business, a large corporate or a one man show your staff, customers and supporters deserve a break for the Christmas period. We at the Lazy Lizard Brew House and Restaurant can help your organisation to express it's thanks to the people that drive your business. Let us work with you to stay within budget, and still give the people that deserve it most a rocking start to the festive season. Email Angelique at angelique@lazylizardbrewhouse.co.za or phone her on (072)702-0606 to set up the date for your end of year function. Big or small we will give your guests the best day of their year. 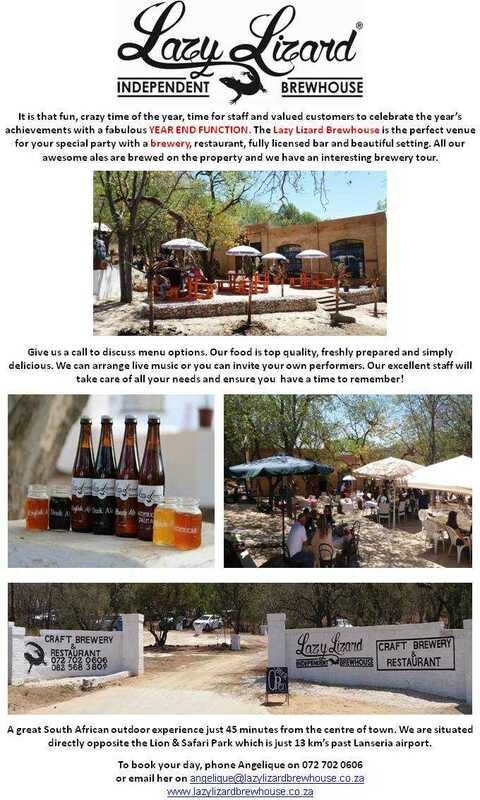 From brewery tours, adventure activities, games, beer tastings, live entertainment, a game drive, wildlife interactions and much more we can arrange a complete one stop Christmas function with seating in the restaurant for up to 100 people. If you don't want to arrange transport, or have staff driving, we can arrange a shuttle service to fetch and carry on your behalf.